This year’s DSEI exhibition held in London from 15-18 September was a good opportunity to discover a bit more about the kit the British military is in the process of buying or wants to buy in the future. It’s a fairly expensive shopping list consisting of armoured vehicles, helicopters, maritime patrol aircraft, radars, frigates – just to name a few. One of the big programmes for the British Army is the new tracked reconnaissance formally known as Scout SV. We say formally, because it’s now the ‘Ajax’ after a name change. In a move that will likely confuse journalists and copy editors for the foreseeable future, the other variants have also been renamed to Ares, Apollo, Atlas, Argus and Athena. Our Land Warfare International Tim Fish editor set out to decipher the name change(s) and find out the latest details on the programme. You can read his report from DSEI here. Another British land programme on the horizon is the Mechanised Infantry Vehicle (MIV), which could see the army procure hundreds of 8×8 vehicles. We spoke with French company Nexter at DSEI about its latest VBCI-2 vehicle, which it said could meet a potential UK requirement. British troops have already have been building mechanised experience on 8×8 vehicles including the French Army’s VBCIs and US Army’s Strykers. 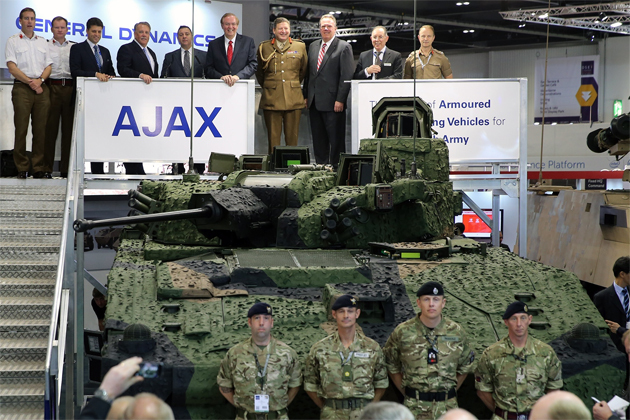 The first prototype of an upgraded Warrior infantry fighting vehicle, fitted with a new turret, was also displayed at DSEI. Unsurprisingly, maritime patrol aircraft was a big topic at the show. The UK is expected to announce a requirement for a new MPA platform in the next Strategic Defence and Security Review (SDSR). Our roving reporter, and resident MPA expert, Beth Maundrill assessed some of the options, including turboprop offerings from Airbus D&S and Alenia Aermacchi. US defence giant Raytheon was expounding the capabilities of its Sentinel aircraft for the maritime role. Lockheed Martin also proposed a ‘modification package’ to convert the RAF’s existing fleet of C-130Js into MPAs. Obviously the frontrunner is still the Boeing P-8 Poseidon, but the company didn’t deem it necessary to brief journalists at the show. Keeping the nautical theme, the Royal Navy briefed press about its latest developments on the Wildcat programme. As part of tests to expand the aircraft’s capabilities, the service recently sent a Wildcat out to Bahrain to test its operating limits in the extreme heats of the Gulf. The Wildcat force commander helpfully explained what the tests involved to one newbie reporter (*cough* me). You can read the report here. The service chiefs were also out in force at the exhibition, giving their respective reasons why they need lots of money as the SDSR looms. Secretary of State Michael Fallon addressed delegates, telling them that the MoD will take a more active role in the UK’s defence exports and will help win export contracts against the French. Ok, he didn’t mention the French but that’s probably what he was thinking. There was lots more DSEI coverage that couldn’t be fit into this short post, so head over to the Shephard Media website to see it all.